Agrotechnomarket.com - The farmers can irrigate their vegetable garden by several different methods. One of them is furrow irrigation method, primarily watering techniques for vegetable gardens. Furrows are most useful when water is let into each furrow from one end, until to the soil. Furrows are shallow trenches between raised beds that channel water to plant roots. The leaf diseases are avoided because the leaves don’t get wet. Leaves and fruit of erect plants will stay dry during furrow irrigation. This watering makes an attractive method for plants that are particularly susceptible, such as squash or peas, beans and peppers. This watering method is based on an old farming technique of planting on narrow raised mounds or beds and then using furrows to water. The beds can be 1 to 3 feet apart — the wider apart they are, the more water you use. Furrows are easiest to manage in soil with a slow infiltration rate. When you’re ready to water, You can slow down the infiltration rate by running enough water in the furrows to get them wet all the way to the end, fill another furrow completely with water, wait a while, and then poke around with your finger to make sure the water has penetrated the bed. Come back later and fill the furrow for irrigation. When the soil in the furrow gets wet and then drains, the soil surface seals so later water soaks in more slowly, making it easier to get water to the end of the furrow and allowing it to soak in evenly all along its length. Successful furrow irrigation requires soil with enough clay so that water flows along shallow ditches between the rows and sinks in slowly. The water must reach the low end of the rows before much has soaked in at the high end. Many sandy or open soils are so porous that water seeps in too quickly, never reaching the end of the row. To solve this problem, use short rows in gardens with sandy soil to slow the force of the water. Most gardens can be irrigated easily with the furrow method by using a hoe or shovel to make shallow ditches. To test furrow irrigation, make one shallow ditch from end to end and run water down it. If the water runs 20 to 30 feet in a few minutes, that’s fine. If the water sinks in too fast at the high end, divide the garden lengthwise into two or more runs and irrigate each run separately. Make a serpentine ditch to guide the water up and down short rows in small gardens on level ground. 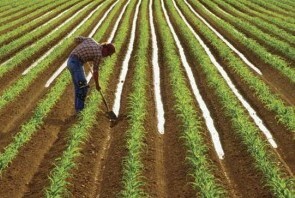 The number of rows which can be irrigated at the same time depends on the volume of water available and your ingenuity. New seedlings are planted into a shallow groove along the ridge top and they can be watered by running water as often as needed to keep the seedbed moist until they are large enough. The surface soil of a raised bed does not pack as with sprinkler irrigation, so there is less crusting. Only a hoe or shovel and a length of hose are needed to get the water from the house faucet to the garden. 0 Response to "Furrow Irrigation for Vegetable Garden"